Mmmmmmm check out this tower of goodies!! Rather than a smaller, fiddlier or more time consuming project, for my boyfriend's brother, I thought I would go large quantity of super tasty treats. A good choice as it turned out. I made a variety of treats: Red velvet cupcakes, chocolate and walnut brownies, millionaire's shortbread, chocolate peanut butter swirly cookies and maple and pecan flapjack. 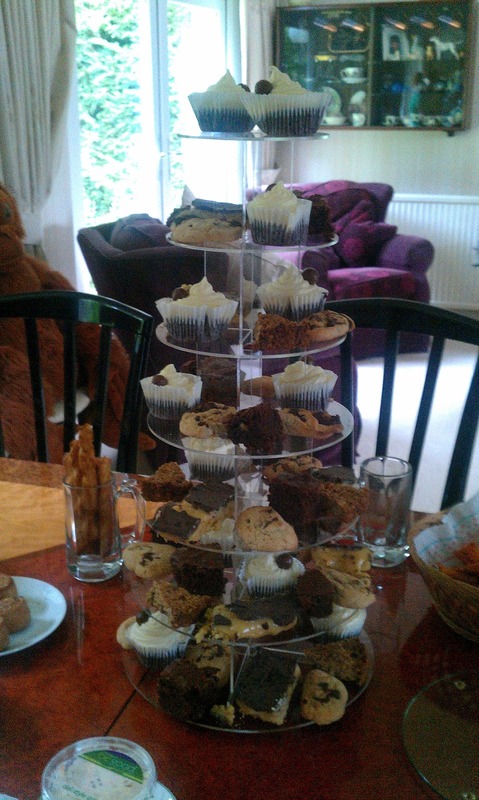 The stand pictured is designed for birthday/wedding cupcake towers, and was a brilliant way to get a huge amount of baked treats out and on display all at once. I got mine on ebay last week, but they are also available from wedding cake companies etc. I totally should have thought to count how many items I managed to get up there, what an oversight.